Where can I check my John Lewis & Partners gift card balance online? Check your John Lewis & partners gift card balance by entering the card details into John Lewis’s official gift card balance checker, found here: John Lewis giftcard balance checker. John Lewis is the largest employee-owned business in the UK. There are 49 John Lewis department stores and 344 Waitrose food shops. John Lewis has been a respected high street name for over 150 years, John Lewis’s online shop at johnlewis.com is one of the UK’s most-visited websites. John Lewis Gift cards can be spent on an unrivalled choice of thousands of products and famous brands across fashion, home and electricals. John Lewis’s Never Knowingly Undersold promise means their leading service and quality always comes at the most competitive price. Where can I check my John Lewis gift card balance online? If you have a John Lewis gift card you can check the balance online by entering the details here: John Lewis giftcard balance checker You’ll need the 19 digit card number found on the back of the card and also the 6 digit PIN (this is found under the scratch-panel on the back of the card). In-store: You can also check your gift card balance at any John Lewis or Waitrose till by handing the card to the member of staff. You can find your nearest John Lewis shop by clicking here. Where can I buy a John Lewis gift card? John Lewis giftcards can be bought from any John Lewis or Waitrose store in the UK. You can also buy a John Lewis giftcard online for delivery to yourself or direct to someone else from the John Lewis’s official giftcard website at https://www.johnlewisgiftcard.com. There is a delivery charge starting from £2, however you can also send an ‘e-gift’ card with electronic delivery, for which there is no delivery charge. Where can I spend my John Lewis gift card? 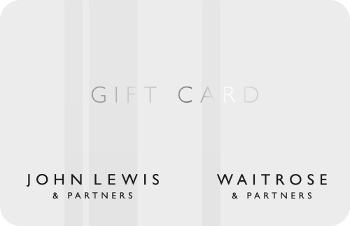 The John Lewis Parnership giftcard is welcome at any of the 49 John Lewis shops, any of the 344 Waitrose shops and also on their websites at https://www.johnlewis.com and https://www.waitrose.com. Anything else I should know about John Lewis Gift Cards? The John Lewis giftcard is valid for 24 months from the date of the last transaction (which counts as a purchase, a refund to the card or a balance enquiry). Because a balance enquiry counts as a transaction you can extend the expiry date of the card for an extra 2 years simply by making an online balance check. This might be particularly important if you are buying the card as a gift for someone else. The John Lewis Partnership giftcard can be loaded with a maximum of £500 so if you want to give more than £500 of John Lewis giftcards then you will need to buy more than one card. Once the card has been loaded, it cannot be ‘topped up’. John Lewis gift cards are a popular choice for wedding gifts and are also a great choice for expectant mothers and fathers, as every John Lewis shop has a baby and nursery department with everything you can think of for a nursery, playroom and that all important hospital bag. You don’t have to spend it all at once! Any balance remaining after making your purchase will be saved on the card for your future use and you’ll have 2 years in which to spend it.